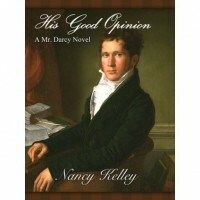 If you love Jane Austen's Pride and Prejudice, you will certainly enjoy Nancy Kelley's His Good Opinion. The book follows the events and Pride and Prejudice but from Mr. Darcy's perspective. The scenes in Longbourn, Netherfield Park, Rosings, London, and Pemberley are enriched by this retelling.